An elegant Mexican style family home located along the San Jose Del Cabo corridor offering stunning views of the Sea of Cortez. Above the longest sandy beach in Los Cabos, Casa Alegria sits within the well manicured residential gated community of La Jolla. Minutes away from grocery stores, schools, hospitals, golf courses, and surf breaks, La Jolla has become the most desired development for affluent locals. The three level Casa Alegria features 4 bedrooms, 3 full bathrooms, 2 half bathrooms, pool, waterfall, lush gardens and a large 3 car garage. 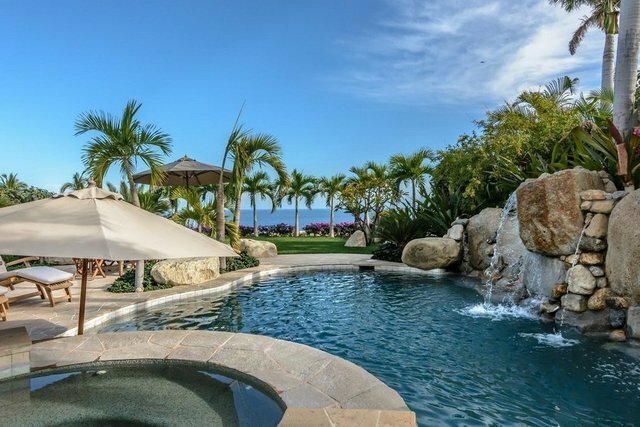 The layout of this three story, fully furnished home takes complete advantage of the beautiful natural beauty that living along the San Jose corridor with the One and Only Palmilla across the bay, can offer both day and night.